Really valuable only when it is colorless and free of impurities Among the minerals is the hardest, but the fire burns him and send him a sharp blow can shatter. The name comes from the greek Adamas, ie 'indomitable', and the term was chosen in reference to its extreme hardness. Precisely because of this characteristic it made the diamond the most wonderful properties such as to render invincible (especially those born in April) and protect from enemies and adversities in the past is even believed that it was able to 'sweat' in the presence of a poison, thus making vain attempts to poisoning. Pure and transparent diamond, Colorless or with delicate pastel shades are used in gemology and are among the most sought-after gemstones. The varieties less rare, as well as artificial diamonds, They are used for industrial purposes. The characteristics of diamond crystals have mostly the form of octahedron or disdyakis dodecahedron (48 triangular faces), often with curved surfaces. On the octahedron faces can sometimes observe small triangular incisions said trigoni. For gemination of two octahedra is dishes crystals can form in the shape of blunt triangle. 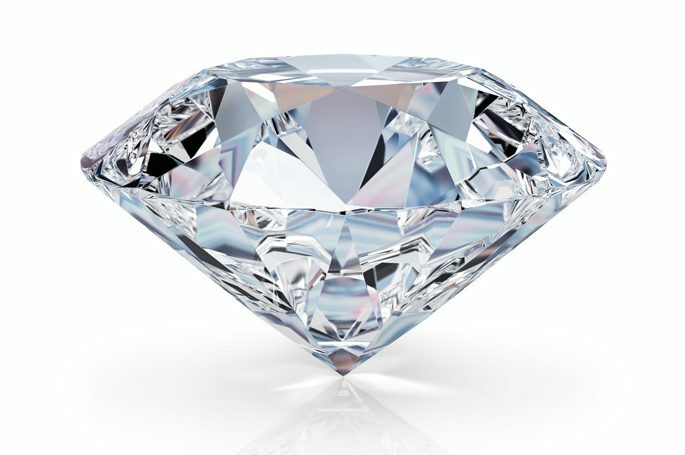 The diamond is made of pure carbon: if it is heated, burns releasing carbon dioxide. It is the hardest mineral that is known, but that does not mean that it is unbreakable: It can be scratched only by another diamond, but a sharp blow can send him to pieces; in fact it is fragile and easily flakes according to the faces of the octahedron. Diamond has a vibrant shine, almost metallic, which is precisely defined 'adamantine'. Many diamonds appear fluorescent under ultraviolet light. How to recognize it "4C"
This is undoubtedly the most important 4C, since the higher the quality of the cut, the better the combination of brilliance and fire of the stone. The cut is the only characteristic directly influenced by man. It 'important to distinguish between the diamond cutting, which is a purely technical issue and the shape of which is a preference of a personal nature. The brilliant cut into round shape is the most known and most appreciated. Other forms of brilliant cut include drop, Marquise (elongated with sharp corners), the oval and heart. Another cut is the emerald. The princess is a shape from the square on the surface cut, brilliant pavilion. When a diamond is cut in the correct proportions, the light is refracted from one facet of the pavilion, and then refl it through the crown and the table of the diamond. If a diamond is cut with a too deep pavilion, a par t of the light is lost through the opposite par t of the pavilion or from the bottom. If the pavilion is rather shallow, the light is refracted on the crown, instead of the pavilion and is lost through the diamond fund. Color is definitely the feature most subjective because different people prefer different color tones. Diamonds come in a variety of shades of white. The evaluation of the color of a diamond for classification purposes is obtained by measuring the degree of approach to the total absence of color. Those who are closest to the absence of color are very rare and are classified D, E, F and G, while most of them are white slightly browned. These are classified by the letter H to the letter L. The classified M and above are visibly colored. There are diamonds that have a very strong pure color which are very rare and are called "Fancy". They can be pink, blu, verde, deep yellow. There are no two diamonds equal to the world. Each one has its own identity due to the presence of small traces of carbon or small crystals of different nature were imprisoned during the crystallization process. color, size and position determine the degree of purity of the diamond. However, most par t of the inclusions are not visible to the naked eye: We need a magnifying glass to ten enlargements and experience jeweler. The weight of diamonds as that of other gems, It is expressed in carats. The word carat originates from ancient times when you used the seeds of the carob tree, by surprisingly regular weight, to weigh gems. Currently the carat is a metric measuring unit which corresponds to 1/ 5 gram, Divided into 100 points.